"Tsiolkovsky" redirects here. For other uses, see Tsiolkovsky (disambiguation). Konstantin Eduardovich Tsiolkovsky (Russian: Константин Эдуардович Циолковский, IPA: [kənstɐnˈtʲin ɪdʊˈardəvʲɪtɕ tsɨɐlˈkofskʲɪj] ( listen); Polish: Konstanty Edward Ciołkowski 17 September [O.S. 5 September] 1857 – 19 September 1935) was a Russian rocket scientist and pioneer of astronautics. Along with the French Robert Esnault-Pelterie, the German Hermann Oberth and the American Robert H. Goddard, he is considered to be one of the founding fathers of modern rocketry and astronautics. His works later inspired leading Soviet rocket engineers such as Sergei Korolev and Valentin Glushko and contributed to the success of the Soviet space program. Tsiolkovsky was born in Izhevskoye (now in Spassky District, Ryazan Oblast), in the Russian Empire, to a middle-class family. His father, Edward Tsiolkovsky was a Polish forester of Russian Orthodox faith who emigrated to Russia; his mother was of mixed Volga Tatar and Russian origin. His father was successively a forester, teacher, and minor government official. At the age of 10, Konstantin caught scarlet fever and became hard of hearing. When he was 13, his mother died. He was not admitted to elementary schools because of his hearing problem, so he was self-taught. As a reclusive home-schooled child, he passed much of his time by reading books and became interested in mathematics and physics. As a teenager, he began to contemplate the possibility of space travel. Tsiolkovsky spent three years attending a Moscow library where Russian cosmism proponent Nikolai Fyodorov worked. He later came to believe that colonizing space would lead to the perfection of the human race, with immortality and a carefree existence. Additionally, inspired by the fiction of Jules Verne, Tsiolkovsky theorized many aspects of space travel and rocket propulsion. He is considered the father of spaceflight and the first person to conceive the space elevator, becoming inspired in 1895 by the newly constructed Eiffel Tower in Paris. Despite the youth's growing knowledge of physics, his father was concerned that he would not be able to provide for himself financially as an adult and brought him back home at the age of 19 after learning that he was overworking himself and going hungry. Afterwards, Tsiolkovsky passed the teacher's exam and went to work at a school in Borovsk near Moscow. He also met and married his wife Varvara Sokolova during this time. Despite being stuck in Kaluga, a small town far from major learning centers, Tsiolkovsky managed to make scientific discoveries on his own. The first two decades of the 20th century were marred by personal tragedy. Tsiolkovsky's son Ignaty committed suicide in 1902, and in 1908 many of his accumulated papers were lost in a flood. In 1911, his daughter Lyubov was arrested for engaging in revolutionary activities. Tsiolkovsky stated that he developed the theory of rocketry only as a supplement to philosophical research on the subject. He wrote more than 400 works including approximately 90 published pieces on space travel and related subjects. Among his works are designs for rockets with steering thrusters, multistage boosters, space stations, airlocks for exiting a spaceship into the vacuum of space, and closed-cycle biological systems to provide food and oxygen for space colonies. Tsiolkovsky's first scientific study dates back to 1880–1881. He wrote a paper called "Theory of Gases," in which he outlined the basis of the kinetic theory of gases, but after submitting it to the Russian Physico-Chemical Society (RPCS), he was informed that his discoveries had already been made 25 years earlier. Undaunted, he pressed ahead with his second work, "The Mechanics of the Animal Organism". It received favorable feedback, and Tsiolkovsky was made a member of the Society. Tsiolkovsky's main works after 1884 dealt with four major areas: the scientific rationale for the all-metal balloon (airship), streamlined airplanes and trains, hovercraft, and rockets for interplanetary travel. In 1892, he was transferred to a new teaching post in Kaluga where he continued to experiment. During this period, Tsiolkovsky began working on a problem that would occupy much of his time during the coming years: an attempt to build an all-metal dirigible that could be expanded or shrunk in size. Tsiolkovsky developed the first aerodynamics laboratory in Russia in his apartment. In 1897, he built the first Russian wind tunnel with an open test section and developed a method of experimentation using it. In 1900, with a grant from the Academy of Sciences, he made a survey using models of the simplest shapes and determined the drag coefficients of the sphere, flat plates, cylinders, cones, and other bodies. Tsiolkovsky's work in the field of aerodynamics was a source of ideas for Russian scientist Nikolay Zhukovsky, the father of modern aerodynamics and hydrodynamics. Tsiolkovsky described the airflow around bodies of different geometric shapes, but because the RPCS did not provide any financial support for this project, he was forced to pay for it largely out of his own pocket. Tsiolkovsky studied the mechanics of powered flying machines, which were designated "dirigibles" (the word "airship" had not yet been invented). Tsiolkovsky first proposed the idea of an all-metal dirigible and built a model of it. The first printed work on the airship was "A Controllable Metallic Balloon" (1892), in which he gave the scientific and technical rationale for the design of an airship with a metal sheath. Progressive for his time, Tsiolkovsky was not supported on the airship project, and the author was refused a grant to build the model. An appeal to the General Aviation Staff of the Russian army also had no success. In 1892, he turned to the new and unexplored field of heavier-than-air aircraft. Tsiolkovsky's idea was to build an airplane with a metal frame. In the article "An Airplane or a Birdlike (Aircraft) Flying Machine" (1894) are descriptions and drawings of a monoplane, which in its appearance and aerodynamics anticipated the design of aircraft that would be constructed 15 to 18 years later. In an Aviation Airplane, the wings have a thick profile with a rounded front edge and the fuselage is faired. But work on the airplane, as well as on the airship, did not receive recognition from the official representatives of Russian science, and Tsiolkovsky's further research had neither monetary nor moral support. In 1914, he displayed his models of all-metal dirigibles at the Aeronautics Congress in St. Petersburg but met with a lukewarm response. Disappointed at this, Tsiolkovsky gave up on space and aeronautical problems with the onset of World War I and instead turned his attention to the problem of alleviating poverty. This occupied his time during the war years until the Russian Revolution in 1917. After writing out this equation, Tsiolkovsky recorded the date: 10 May 1897. In the same year, the formula for the motion of a body of variable mass was published in the thesis of the Russian mathematician I. V. Meshchersky ("Dynamics of a Point of Variable Mass," I. V. Meshchersky, St. Petersburg, 1897). His most important work, published in May 1903, was Exploration of Outer Space by Means of Rocket Devices (Russian: Исследование мировых пространств реактивными приборами). Tsiolkovsky calculated, using the Tsiolkovsky equation,:1 that the horizontal speed required for a minimal orbit around the Earth is 8,000 m/s (5 miles per second) and that this could be achieved by means of a multistage rocket fueled by liquid oxygen and liquid hydrogen. In the article "Exploration of Outer Space by Means of Rocket Devices", it was proved for the first time that a rocket could perform space flight. In this article and its subsequent sequels (1911 and 1914), he developed some ideas of missiles and considered the use of liquid rocket engines. The outward appearance of Tsiolkovsky's spacecraft design, published in 1903, was a basis for modern spaceship design. The design had a hull divided into three main sections. The pilot and copilot were in the first section, the second and third sections held the liquid oxygen and liquid hydrogen needed to fuel the spacecraft. However, the result of the first publication was not what Tsiolkovsky expected. No foreign scientists appreciated his research, which today is a major scientific discipline. In 1911 he published the second part of the work "Exploration of Outer Space by Means of Rocket Devices". Here Tsiolkovsky evaluated the work needed to overcome the force of gravity, determined the speed needed to propel the device into the solar system ("escape velocity"), and examined calculation of flight time. The publication of this article made a splash in the scientific world, Tsiolkovsky found many friends among his fellow scientists. In 1926–1929, Tsiolkovsky solved the practical problem regarding the role played by rocket fuel in getting to escape velocity and leaving the Earth. He showed that the final speed of the rocket depends on the rate of gas flowing from it and on how the weight of the fuel relates to the weight of the empty rocket. Tsiolkovsky conceived a number of ideas that have been later used in rockets. They include: gas rudders (graphite) for controlling a rocket's flight and changing the trajectory of its center of mass, the use of components of the fuel to cool the outer shell of the spacecraft (during re-entry to Earth) and the walls of the combustion chamber and nozzle, a pump system for feeding the fuel components, the optimal descent trajectory of the spacecraft while returning from space, etc. In the field of rocket propellants, Tsiolkovsky studied a large number of different oxidizers and combustible fuels and recommended specific pairings: liquid oxygen and hydrogen, and oxygen with hydrocarbons. Tsiolkovsky did much fruitful work on the creation of the theory of jet aircraft, and invented his chart Gas Turbine Engine. [clarification needed] In 1927 he published the theory and design of a train on an air cushion. He first proposed a "bottom of the retractable body" chassis. [clarification needed] However, space flight and the airship were the main problems to which he devoted his life. Tsiolkovsky had been developing the idea of the hovercraft since 1921, publishing a fundamental paper on it in 1927, entitled "Air Resistance and the Express Train" (Russian: Сопротивление воздуха и скорый по́езд). In 1929, Tsiolkovsky proposed the construction of multistage rockets in his book Space Rocket Trains (Russian: Космические ракетные поезда). Tsiolkovsky championed the idea of the diversity of life in the universe and was the first theorist and advocate of human spaceflight. Tsiolkovsky never built a rocket; he apparently did not expect many of his theories to ever be implemented. Hearing problems did not prevent the scientist from having a good understanding of music, as outlined in his work "The Origin of Music and Its Essence." Only late in his lifetime was Tsiolkovsky honored for his pioneering work. In particular, his support of eugenics made him politically unpopular. However, from the mid 1920s onwards the importance of his other work was acknowledged, and he was honoured for it and the Soviet state provided financial backing for his research. He was initially popularized in Soviet Russia in 1931–1932 mainly by two writers: Iakov Perel'man and Nikolai Rynin. Tsiolkovsky died in Kaluga on 19 September 1935 after undergoing an operation for stomach cancer. He bequeathed his life's work to the Soviet state. In 1989, Tsiolkovsky was inducted into the International Air & Space Hall of Fame at the San Diego Air & Space Museum. The cover of the book The Will of the Universe. 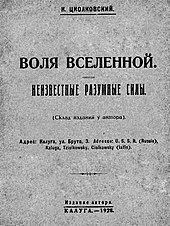 The Unknown Intelligence by Konstantin Tsiolkovsky, 1928, considered to be a work of Cosmist philosophy. Tsiolkovsky wrote a book called The Will of the Universe. The Unknown Intelligence in 1928 in which he propounded a philosophy of panpsychism. He believed humans would eventually colonize the Milky Way galaxy. His thought preceded the Space Age by several decades, and some of what he foresaw in his imagination has come into being since his death. 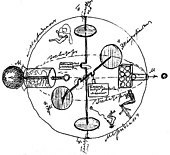 Tsiolkovsky also did not believe in traditional religious cosmology, but instead (and to the chagrin of the Soviet authorities) he believed in a cosmic being that governed humans as "marionettes, mechanical puppets, machines, movie characters", thereby adhering to a mechanical view of the universe, which he believed would be controlled in the millennia to come through the power of human science and industry. In 1964, The Monument to the Conquerors of Space was erected to celebrate the achievements of the Soviet people in space exploration. Located in Moscow, the monument is 107 meters (350 feet) tall and covered with titanium cladding. The main part of the monument is a giant obelisk topped by a rocket and resembling in shape the exhaust plume of the rocket. A statue of Konstantin Tsiolkovsky, the precursor of astronautics, is located in front of the obelisk. The State Museum of the History of Cosmonautics in Kaluga now bears his name. The town Uglegorsk in Amur Oblast was renamed Tsiolkovsky by Russian president Vladimir Putin in 2015. There is a statue of Konstantin Tsiolkovsky directly outside the Sir Thomas Brisbane Planetarium in Brisbane, Queensland, Australia. There is a Google Doodle honoring the famous pioneer. Tsiolkovsky was consulted for the script to the early Soviet science-fiction film, Kosmicheskiy reys. SF writer Alexander Beliaev has written a book in which a city and a space station are named after him. A lunar station is named Tsiolkovsky in Stanisław Lem's novel Tales of Pirx the Pilot, story "The Conditional Reflex". The Soviet ship in Harry Turtledove's 1990 Mars exploration novel A World of Difference is named Tsiolkovsky. In Princeton physicist and space colony advocate Gerard K. O'Neill's book of futurism, 2081: A Hopeful View of the Human Future, the protagonist rides a spaceship named the Konstantin Tsiolokovsky from his home in a space colony at twice the orbital radius of Pluto to the Earth of 2081. A space station is named Tsiolkovsky 1 in William Gibson's short story "Hinterlands". The character Aeolia Schenberg in the anime series Mobile Suit Gundam 00 is based on Tsiolkovsky. The Zvezda module of the International Space Station has photos of Tsiolkovsky and Yuri Gagarin posted on the wall above the aft hatchway. The Mars-based space elevators in the Horus Heresy novel Mechanicum by Graham McNeill set in the Warhammer 40k universe are called "Tsiolkovsky Towers". The science ship in the Star Trek: The Next Generation episode "The Naked Now" is named after him. Episode eight of Denpa Onna to Seishun Otoko is called "Tsiolkovsky's Prayer". In the book Limit, written by Frank Schätzing in 2009, the theory of the Space Elevator is applied in a hypothetical future. The video-games Sid Meier's Alpha Centauri and Sid Meier's Alien Crossfire use one of Konstantin Tsiolkovsky's quotes when the technology of the Space Elevator is developed. In the video-game Mass Effect 2, one of Konstantin Tsiolkovsky's quotes is used in an in-game advertisement. In the comic book series Assassin's Creed: The Fall, the leader of the Assassin Order reads from The Will of the Universe. In a 2015 episode of Murdoch Mysteries, set in about 1905, an inventor works with Tsiolkovsky's daughter to build a suborbital rocket based on his ideas and be the first man in space; a second rocket built to the same design is adapted as a ballistic missile for purposes of extortion. ^ "International Space Hall of Fame :: New Mexico Museum of Space History :: Inductee Profile". www.nmspacemuseum.org. Retrieved 10 August 2017. ^ "Konstantin E. Tsiolkovsky". Aeronautics Learning Laboratory for Science Technology, and Research (ALLSTAR) Network. 12 March 2004. Archived from the original on 28 October 2015. Retrieved 10 June 2015. ^ Lewis, Cathleen Susan. 2008. The Red Stuff: A History of the Public and Material Culture of Early Human Spaceflight in the U.S.S.R. Ann Arbor, Mich: ProQuest LLC. pp. 57–59. ISBN 9780549466796. ^ A Pictorial History of Rockets. NASA. 2011. p. 4. ^ "Константин Циолковский. Биография, 18 фото". Top-antropos.com. Retrieved 10 August 2017. ^ a b The life of Konstantin Eduardovitch Tsiolkovsky 1857–1935 Archived 15 June 2012 at the Wayback Machine. Informatics.org (19 September 1935). Retrieved 4 May 2012. ^ Kazyutinski V. V. (2003). "Космическая философия К.Э. Циолковского: за и против". Земля и Вселенная. 4: 43–54. Archived from the original on 11 February 2007. ^ Konstantin Tsiolkovsky – Russiapedia Space and aviation Prominent Russians. Russiapedia.rt.com. Retrieved 4 May 2012. ^ Sprekelmeyer, Linda ed. (2006) These We Honor: The International Aerospace Hall of Fame. Donning Co. Publishers. ISBN 978-1-57864-397-4. ^ Soviet Missions to the Moon. Nssdc.gsfc.nasa.gov. Retrieved 4 May 2012. ^ "Konstantin Tsiolkovsky's 155th birthday". Google Doodles. Google. Retrieved 15 January 2017. ^ Hall, Phil (9 July 2010). "The Bootleg Files: The Space Voyage". Film Threat. Retrieved 12 July 2010. ^ International Space Station Imagery. Spaceflight.nasa.gov (31 October 2004). Retrieved 4 May 2012. ^ McNeill, Graham (2008), Mechanicum: war comes to Mars (print), Horus Heresy [book series], 9, Map by Adrian Wood (1st UK ed. ), Nottingham, UK: Black Library, [Map:] "The Tharsis Quadrangle of Mars" [pp. 8–9 (not numbered), context at p. 8], ISBN 978-1-84416-664-0 Location of "Tsiolkovsky towers" noted in a story-related map, with several mentions in the book's body matter, including pp. 218, 368, 370, and others. Miller, Ron (1993). The Dream Machines. Krieger Publishing Company. ISBN 0-89464-039-9. Georgiy Stepanovich Vetrov, S. P. Korolyov and space. First steps. — 1994 M. Nauka, ISBN 5-02-000214-3. Wikimedia Commons has media related to Konstantin Tsiolkovsky. The Foundations of the Space Age. The life and work of Tsiolkovskiy, by Vladimir V. Lytkin, Tsiolkovskiy Museum, Kaluga. This page was last edited on 17 April 2019, at 23:16 (UTC).